Whatever happened to Trump's new border patrol officers? President Trump, days after entering office, signed an executive order to hire 15,000 new border security agents and immigration officers, in step with his campaign platform that was tough on illegal immigration. Now, more than six months into his tenure, that plan to add 5,000 more border patrol agents at U.S. Customs and Border Protection (CBP) and 10,000 more immigration officers at Immigration and Customs Enforcement (ICE) isn't looking so simple. The Office of Personnel Management has given a two-year window to move forward with the hiring surge, but immigration and border experts -- including the Department of Homeland Security's own watchdog -- note the logistical challenges of hiring that many new employees, and question whether they're necessary in the first place. A late July DHS Office of Inspector General (OIG) report was the latest blow to the president's plan. "Neither CBP nor ICE could provide complete data to support the operational need or deployment strategies for the additional 15,000 additional agents and officers they were directed to hire," the report found. Moreover, CBP and ICE don't know how many additional personnel they need, and it will be three or four years before those agencies will complete calculating those figures. Tony Payan, director of the Mexico Center at the Baker Institute at Rice University, said the number of new hires the Trump administration suggested seems like an "arbitrary number." "So what is the optimum number for the border patrol?" Payan said. "We don't really have a baseline right now. I think saying that we need 25 percent more, or we need to double ICE, at this point in time it sounds to me more like ... sort of an arbitrary number." The administration's intent to hire thousands more border agents and immigration officers faces serious logistical issues as well. To even find 5,000 qualified applicants at CBP, the agency would need an applicant pool of 750,000 people, according to the OIG report. To find 10,000 qualified immigration officers at ICE, the agency would need more than half a million people to apply. Even if that many people applied, which would be about as many applicants as there are residents of Dallas, human resources staffers in those agencies would have a hard time vetting them all. DHS' human resources servicing ratio is the lowest of any large federal agency, the OIG report pointed out, at one HR employee for every 148 employees. The OIG found DHS would need to hire hundreds more human resources staffers. "Although DHS has established plans and initiated actions to begin an aggressive hiring surge, in recent years the department and its components have encountered notable difficulties related to long hire times, proper allocation of staff, and the supply of human resources," the report said. CBP experienced a hiring surge under former President George W. Bush and former President Barack Obama, roughly doubling the size of its workforce from 10,000 to 20,000 in a relatively short period of time. Occasionally, crucial steps in the hiring process -- like complete background checks -- were skipped. 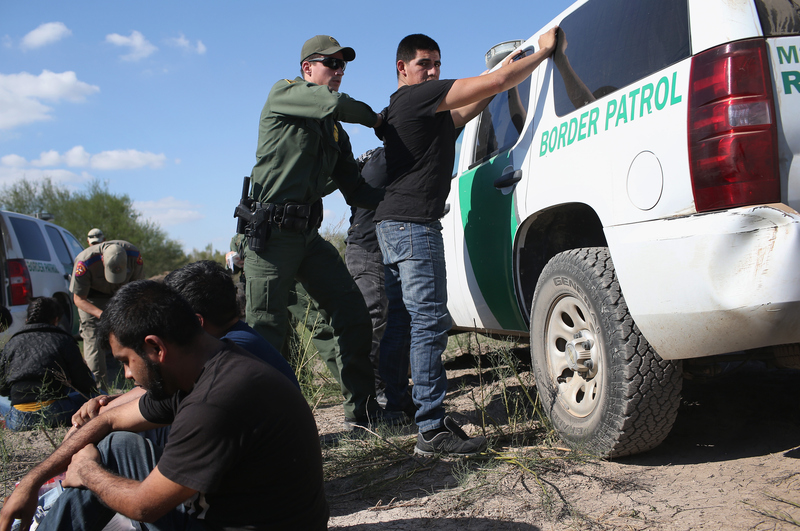 The challenges don't end once those new border agents and immigration officers are hired, said Christopher Wilson, deputy director of the Mexico Institute at the Woodrow Wilson International Center for Scholars. "Hiring another 5,000 agents will put another strain on an agency that's struggled to maintain professionalism and professional standards," Wilson said. The pro-immigration American Immigration Council, for instance, released a reporter earlier this month from a request under the Freedom of Information Act showing the CBP took no action against border patrol agents in 96 percent of 2,179 cases of alleged misconduct filed between 2012 and 2015. If a vast percentage of an agency's workers have no experience handling the difficult and sometimes emotionally charged situations they encounter, that leads to mistakes, Payan said. New officers are "not well seasoned," Payan said. It takes time for immigration officers to respond quickly and swiftly but without overreacting. "That kind of experience takes a very long time," Payan said. "And when you have a law enforcement agency that doesn't allow for that kind of maturity to take place, you see mistakes." CBP did not respond with a request for comment on the hiring progress made since Mr. Trump took office. ICE did not have figures on its current staffing levels or number of people hired since January readily available, but said it is making progress in the hiring process. "U.S. Immigration and Customs Enforcement (ICE) is working on implementing a plan to hire the additional 10,000 employees mandated in the executive order," Dani Bennett, an ICE spokesman, told CBS News. "Those hired pursuant to the president's direction under the executive order will focus on both civil and criminal immigration enforcement, including the smuggling of people and other contraband by transnational criminal organizations. Additional personnel will also be hired to carry out support functions of the executive order." Bennett added that, "ICE will not lower its standards to achieving hiring goals," and uses a "competitive" hiring process to vet applicants. DHS currently has an acting head, Elaine Duke, since Mr. Trump selected former DHS head John Kelly to be his chief of staff at the White House. Increasing the number of immigration enforcers leaves other backlogs in the immigration system unaddressed, Wilson and Payan said. In recent years, a growing number of people crossing the border are turning themselves in and requesting asylum, instead of hiding from immigration officials. That requires a different kind of approach to immigration, they said. The Trump administration's strategy of beefing up immigration personnel is also leaving out one major component -- the country's immigration courts, which are experiencing historic backlogs. With the nation's approximately 250 immigration court judges overwhelmed by about 575,000 pending immigration cases, the United States' immigration courts are increasingly backlogged, according to Syracuse University's Transactional Records Access Clearinghouse. The average case has already been pending for 667 days, or nearly two years. Hiring more ICE officers could simply accelerate the number of pending immigration court cases, with no additional judges to handle them, Wilson and Payan said. "ICE is actually engaged in a kind of strange case where they're also adding to the load of the immigration courts than the courts can actually process the cases, because they're actually being very effective," Payan said.